I couldn't resist making some paper pieced Christmas trees last weekend. I started to embellish them with buttons as ornaments, but then thought the small circles on selvages would work just as well. Cute, huh? I turned a few of them into mug rugs. 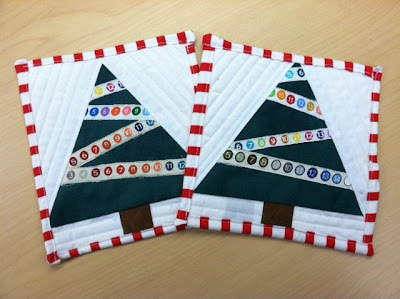 One will go to my Secret Santa partner over on the Quilting Board. I'm going to make 1 more to have a set of 2 to keep. Love the candy cane binding too! Great job! I love how it looks like lights on the trees. What a clever idea! Fantastic idea. What a great way to use the selvages! I like those a lot. Very cute! 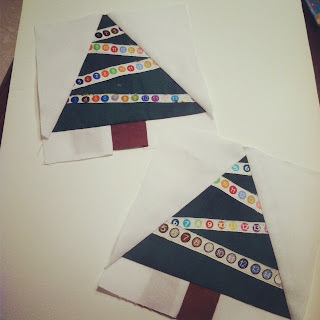 Hope it is ok if I steal your selvage tree idea. They are too cute, and I have a rubbermade tub FULL of selvages. @Laura: totally fine to copy. And if you need to "unload" any of those selvages let me know, lol. Those look great, I can totally see matching potholders, too. The dots really do look like ornaments. THis is the first time I've seen a project with selvedges that has actually made me want to use mine! I really like the trees! Those are SO cute!!! Great job! What a great idea! Love those Christmas trees! OH my gosh! I love the mug rig idea! So cute! I totally love that idea and will probably steal it! I already have a thing for scrappy tree blocks, but this is sheer genius! Cute! Very creative idea! I am going to have to see if I can make some of these!! your trees are so cute! I love that you used selvedges for the trim. perfect!!!! Oh so smart & wicked cute! Listened to your podcast yesterday from December 2011, then looked at this post and became your follower as well. I have been listening to your podcasts for some time-now I'm catching up on the old ones! Your voice is great for "radio", and I look forward to your book reviews! I even ordered the Walton's video season 2, "The Prize" so I could see Gramma Waltons quilt! Your post about TMI w/your parents and the olon cleanse made me laugh out loud! One question- I am also a paper piecer. 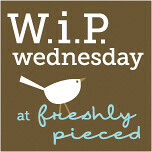 Did you paper piece the selvedges or applique them on top?